Tony's Movie Review for May 5, 2017 "Guardians of the Galaxy Vol. 2"
Set to the backdrop of 'Awesome Mixtape #2,' “Guardians of the Galaxy Vol. 2” continues the team's adventures as they traverse the outer reaches of the cosmos. “Guardians of the Galaxy Vol. 2” is as fun and unexpected as the first film. Set just a few weeks after their first adventure, “The Guardians” go from being universal heroes to the galaxy's most wanted and now must avoid their hunters. In the process Peter Quill, I mean 'Star Lord,' discovers the truth about his special lineage, making him question his place in the universe. “Guardians 2” is well-written and action packed with a near-perfect balance of humor, heart and action to keep the audience glued to their seats. “Guardians of the Galaxy Vol. 2” ends being a sequel well worth the wait. It gets a B and is rated PG-13. 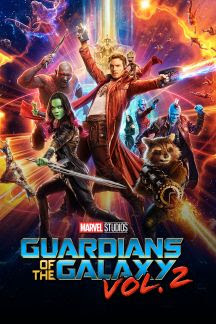 And remember if you haven't seen the first "Guardians of the Galaxy," check it out and other great sci-fi films at www.dvd.netflix.com. And get your first month FREE!